Computer-based training, simulation environments, and super users are a few of the tools at the disposal of healthcare organizations. When UT Medical Group, Inc (UTMG) deployed the TouchWorks Electronic Health Record system in 2007, the implementation team knew that success or failure rested primarily on how well and how quickly the practice’s 1,000 physicians and users embraced the system after go-live. That is why UTMG, the University of Tennessee Health Science Center College of Medicine’s faculty group practice, brought in The Breakaway Group to design a customized learning and training program. To help ensure fast, sustainable adoption of the system, the consulting firm created a program that emphasized change leadership and engaged key stakeholders from within each department who would be impacted by the new system to develop revised workflows. To that end, The Breakaway Group designed role and task-based simulation programs to train individual end users about the system aspects that most affected their specific positions. By tailoring simulators to specific end-user roles and making them available on demand for training when and where it was most convenient, this approach helped ensure that each end user would be initially trained on the most important features for their positions. Because simulators are available and maintained for up to three years after go-live, it also allowed staff members to learn the rest of the system as their schedules and comfort levels permitted. Most importantly, the simulators introduced a high level of consistency into system training—something that is often missing when education is handled by multiple people in various settings. In the case of upgrades to existing systems, simulators also enable users to focus only on the new features rather than repeating the full system training program. “That is where the simulators absolutely make a world of difference. They are highly targeted to an individual’s job task, and they are teaching what they absolutely must know on day one to get their jobs done,” says Woodside. With budgets tightening, healthcare organizations cannot afford to continue investing millions into technologies that ultimately fail because their staffs are not able or willing to use applications to their fullest extent. 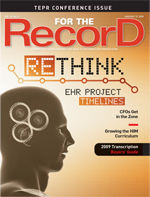 In a report for the Agency for Healthcare Research and Quality (AHRQ) focused on challenges faced by AHRQ HIT grant recipients, the Center for Information Technology Leadership (CITL) and the AHRQ National Resource Center for Health Information Technology identified staff training and outreach and clinician adoption as two of the most crucial components to successful IT implementations. “If clinicians do not buy into a new health IT tool, they will not use it; if they do not use the tool, the project will be considered a failure,” the report stated. Also cited as crucial to adoption were, among other things, integration into current workflow and highlighting the value-add of any new tools or functions. To that end, healthcare organizations are beginning to place a greater focus on the training and education that takes place after go-live, including a growing interest in providing targeted computer-based training. This helps ensure end users have the immediate skills they need to incorporate new technologies into their workflows, as well as the ongoing support necessary to sustain their familiarity and adapt to the ongoing upgrades that are constants with IT. That is why the firm designs each simulator to reflect the immediate needs of each job function. Scenario-based training using the simulators takes an average of six to 10 minutes per task, making it more convenient for end users to fit training into their schedules and get up to speed quickly. The simulators also provide sustainability. Training can be replicated for new hires and adjusted to accommodate changes in both the application and workflows over time. End users can also go back to the simulators for up to three years to refresh or expand their skills on the system. The simulators also allow for efficient cross-application workflow education, which trains end users on how to use multiple applications simultaneously as called for in their job roles. Ultimately, this type of computer-based, on-demand training allows organizations to significantly reduce the time it takes for end users to achieve maximum proficiency on new and upgraded applications—in some cases by as much as 65% compared with more traditional training methods. Fred notes that the process enabled The Breakaway Group to “give back” 101,000 patient care days by eliminating the need for staff members to take time away from their jobs. While ongoing training and support are crucial to sustaining end-user adoption once the novelty of the new system wears off, the challenge for most healthcare organizations that are not utilizing computer-based training is limited funds to provide dedicated, long-term live support. As a result, end users are often left to their own devices shortly after go-live, which is a prescription for failure. Young-Hise notes that many organizations train super users to provide training and support before, during, and after go-live. They can be valuable resources for sustaining end-user adoption but only if they remain engaged in the process beyond the post go-live support window. Establishing a process that keeps super users engaged, even when things are going well, is a solid strategy for speeding and sustaining end-user adoption. For example, keeping super users informed of changes or upgrades to the system and/or providing them with ongoing education about how new systems interact with existing ones or impact multiple job functions enables them to remain a key resource for their colleagues. Several Beacon Partners clients have accomplished this by making their super-user groups a permanent fixture in the organization. They routinely hold meetings to discuss any internal or vendor-driven system changes, solicit input on potential enhancements, and discuss feedback from end users. These meetings arm super users with the information they need to continue providing the support necessary to optimize the use of the system. They also keep end users engaged by providing a forum for their concerns and suggestions to be heard. It’s also important to acknowledge that super users typically have other responsibilities within the organization. As such, Young-Hise recommends keeping the meetings to no longer than one hour and publishing the agenda in advance to stay on track. She also recommends that supervisors be instructed to watch for staff members who are struggling with the new system, so they can undergo refresher training as necessary. For physicians, Young-Hise suggests having a dedicated support person who is available to interact with them on a regular basis to immediately handle any issues that arise as they go about their routines. “Having an identifiable provider support person is really the key to physician adoption,” she says. “They have to know that they have an ally, a liaison to the IT department. You need to have that ‘United Nations’ person there doing the interpretation. Plus, physicians are more likely to do on-the-spot refresher training. That’s the opportunity. “…It sounds overwhelming in terms of resources, but one person for an average community-sized hospital can typically pull it off,” she adds. Whether an organization opts for computer-based training or extended support from super users, knowing the staff’s proficiency, as well as their learning and communication styles and preferences—and tailoring training to them—will make all the difference when it comes to speeding and sustaining adoption. “There is still the need for coaches at the elbow, and all people don’t learn the same way,” says Woodside, who suggests having reference materials available at every workstation in both printed and online formats. Making it easy for end users to fit training into their schedules is also key. Young-Hise notes that one of the first things she does is to evaluate the lines of communication to determine whether they are working and how they can be improved. Often, the communication style will be unique to each department. “The key is to keep it concise, factual, and pertinent. If they have a choice between reading something that will give them the information in less than 30 seconds or reading a two-page dissertation, they aren’t going to read the two pages,” she says. Young-Hise also recommends that organizations create their own training materials. When possible, provide these on disk, so staff members can practice at home or at their convenience. It is also important to schedule adequate practice time and test for proficiency. “Just like any college professor will tell you, you have to use all your possible techniques for teaching,” she says. Physician practices face the same end-user adoption challenges as their hospital and health system counterparts. The problem is that they typically have even fewer resources to dedicate to the problem. While the “train the trainer” approach is effective, Claybrook notes that in a busy practice, it is often difficult to find one person who is willing or has the time to take on the role. High turnover rates can also lead to frustration; if the trainer leaves, there is no one left to train new staff members or support existing ones. The solution may be as simple as asking every staff member about their various proficiencies to identify individuals who may already have the skills necessary to help bring their colleagues up to speed more efficiently than would be possible with just the training offered by the vendor. “Someone could be sitting there with a wealth of skills you won’t know about until you ask,” says Claybrook, who also recommends measuring the proficiency levels of everyone on staff to ensure that they have access to the appropriate level of training. Ultimately, however, the healthcare industry needs to begin integrating software and computer training into the core curriculum at medical and nursing schools to ensure students are entering the workforce with at least the basic skills they need to adapt easily to the new technology-intensive world of healthcare.